Robert Texeira was fishing on the Ka'u Coast of the Big Island when he landed this 110-lb white ulua (giant trevally). 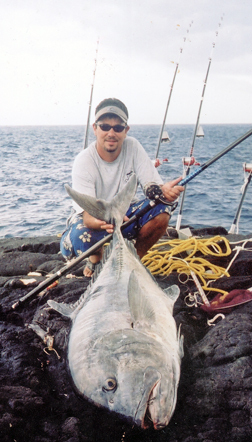 He battled the fish with a 12-foot Talon pole, 80-lb test Maxima line and a Newell 546 reel. This is Robert's fourth ulua weighing over 100 lbs. Awesome!